If you want to understand something in depth, you should ask about its roots. If we want to grasp what Schoenstatt is, we have to investigate the founding act from which it has developed. This takes us to a place – Schoenstatt – in the valley of Vallendar (Germany) and to a date, October 18, 1914. On that day in the old chapel of St. Michael which had been recently restored, Father Kentenich sealed a Covenant of Love with the Blessed Virgin. The talk he gave on that occasion to the young seminarians was acknowledged by him, many years later, as the founding document of the Schoenstatt Movement. His testimony is decisive. Upon comparing the history of the Schoenstatt Shrine with other places where the Virgin Mary has also manifested herself, we confirm likenesses and differences. Something common to all: God always seeks human instruments through which he comes close to mankind. In 1858, the Virgin Mary appears in the grotto of Lourdes to Bernadette Soubirous, a humble shepherdess (peasant) who is the only one to receive and to transmit the message of the Lady. In 1917, the Blessed Mother appears again in Fátima in a series of manifestations which culminate with the famous “dance of the Sun” on the 13th of October of that same year, but the only ones who heard the message were the three shepherd children. In October of 1914, the Mother of God takes a new initiative in Schoenstatt, Germany and now the human instrument is a young 29 year old priest, Father Joseph Kentenich. Up to here are the likenesses. But let us also see the differences. In Paris, Lourdes, and Fátima, Mary is visible. On the other hand, it is not this way in Schoenstatt. The action of the human instrument is thus far more active upon grasping the plan of God and guided solely by a practical faith in Divine Providence. On that 18th of October, Father Kentenich tells his listeners of “a secret and favorite idea,” a “bold thought,” something he had been chewing on for quite some time. Would it then not be possible for our little sodality chapel to likewise become for us the Tabor on which the glory of Mary would be revealed? Three months earlier, on the 18th of July, he had received an article written by Father Cipriano Frolich telling the story of the Shrine of Pompei (Italy). It had come forth, not as in other places by an apparition of the Virgin Mary. God chose a human instrument there to fulfill his plans: a lawyer, Bartolo Longo (recently beatified by His Holiness John Paul II). The parallel was convincing. 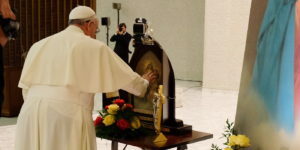 What had taken place in Pompei, could it not also take place in Schoenstatt? His proposal was truly daring. But – he told the young seminarians – “How often in world history have not small and insignificant beginnings been the source of great and greater accomplishments! Why could that not also hold true in our case?” It had to do with drawing down our Lady and Sovereign, to erect here her throne in a special way, to dispense her treasures and to work miracles of grace. The history of Schoenstatt since that day – a day like any other, but at the same time, a different day – proves that those desires became facts. In the little chapel of St. Michael, the Mother of God has erected her throne in a special way, she has dispensed her treasures, she has worked miracles of grace. A tree’s fruitfulness can be seen by its fruits. Joseph Engling, one of the first members of the Schoenstatt Marian sodality, offered his life to the Blessed Mother for Schoenstatt and died on the battlefield in Cambrai (4.10.1918). Fr. Kentenich saw Joseph Engling’s life and heroic striving for sanctity as the first sign of Mary’s educational action from the shrine. From those early days up until now, many heroes have emerged from Schoenstatt’s ranks and their lives became a testimony of the serious striving for sanctity. Some of their names include: Max Brunner and Hans Wormer, Karl Leisner, Julio Steinkaul, Fr. Franz Reinisch, Sr. Maria Emilie Engel, Maria Laufenberg, Mario Hiriart, Sr. Emmanuele, Monsignor Enrique Tenhumberg and many others. Fr. Joseph Kentenich’s heroic life, however, is the greatest of these signs.